Continuing the previous article: The Unknown Mysteries of Battle for Azeroth, more comments during the World of Warcraft: Gameplay & Systems panel raise the mystery bar on some of the expansion’s content. The joke about the difficulty for the Alliance to bypass the Silvermoon City loading screen at the gates north of Eastern Plaguelands is repeated a couple of times in different panels. I think everyone pretty much knows about the portal and the loading screen to be reminded of it… unless it is a tease — which brings me to speculate whether Battle for Azeroth will finally merge Quel’Thalas and the rest of Eastern Kingdoms together without the loading screen. 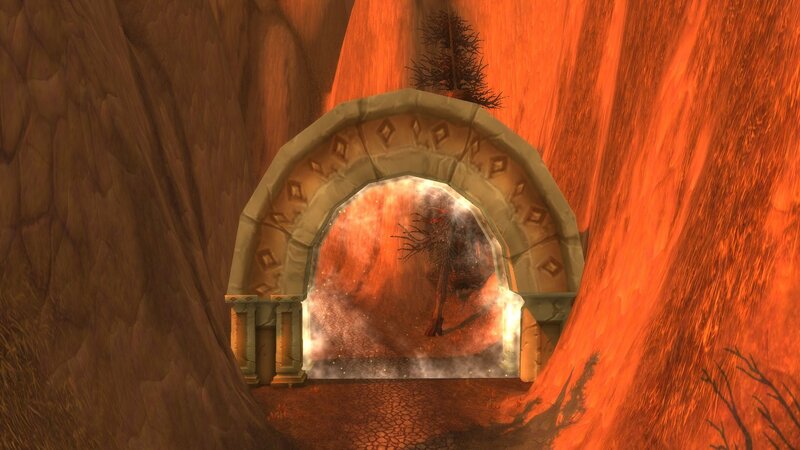 Quel’Thalas was originally introduced in Burning Crusade — the first World of Warcraft expansion (in Jan 15, 2007). At that point in time, you could only access Silvermoon and Exodar if you had purchased the expansion. So that content was split from the vanilla server (or at least the client). However, as new expansions came out and Blizzard’s technologies grew, Blizzard integrated all the previous expansions content into a single World of Warcraft Battle Chest installation which included all those expansions bundled into one. That makes the original purpose of the Quel’Thalas loading screen obsolete. You no longer need Quel’Thalas to be separate from the rest of the Eastern Kingdoms. 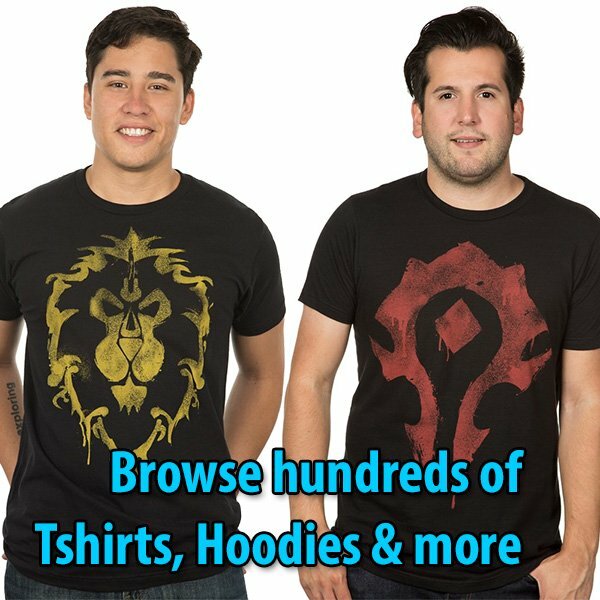 You buy World of Warcraft nowadays for $19.99 which includes the whole level 1-100 experience, then buy the Legion expansion separately for $49.99 for the level 100-110 experience. The Cataclysm revamp of the old world missed the opportunity to annex Quel’Thalas into the revamped flyable world. Maybe Battle for Azeroth finally amends the neglected deed? 1. Where did you go to travel to Eastern Plaguelands, Western Plaguelands, Arathi Highlands, Hinterlands, Hillsbrad Foothills, etc.? 2. If you were in any of those areas already, where did you go to travel to Stranglethorne Vale? 3. If you were in any of those areas already, where did you go to travel to Northrend? 4. Where did you go to travel to Orgrimmar? The answer to all of those is: Tirisfal Glades. You either went to the Undercity Flight Master, or boarded one of the Zeppelins. Well, there is no longer a Undercity to go to as a Horde player, and if there is Alliance presence there, likely there is no Zeppelin either. What we do know is that Silvermoon City is the last bastion of the Horde in the Eastern Kingdoms continent. Doesn’t that mean that Silvermoon City is now the new main hub of Horde activities in the Eastern Kingdoms continent? If so, doesn’t that mean that a level 120 revamp of the city might be necessary adding quests for targets we need to defend throughout Lordaeron? Doesn’t that mean that in order to carry those tasks we need transportation? 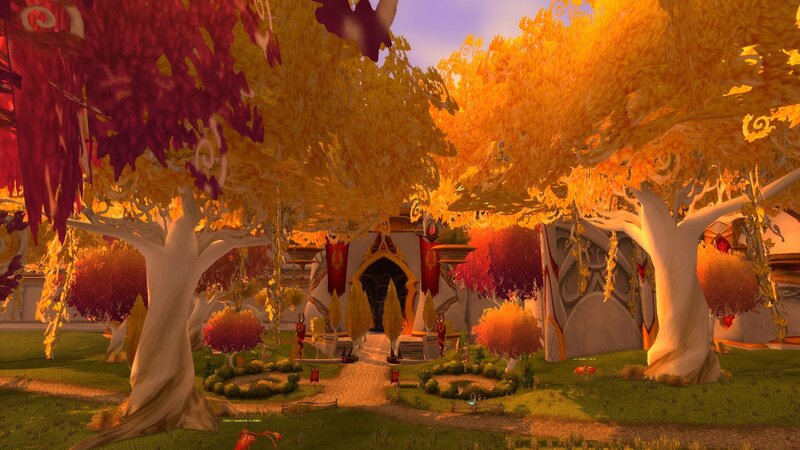 Would it be too far-fetched to think that in order to allow this, the massive Quel’Thalas instance needs to be reworked to annex it to the open world? Bye, loading screen? Now for the Horde, you have got to make a stand here. You have already lost your most defensible position. This is your time to prevent the alliance from building up. It is also a great place to launch attacks on Gilneas, if we were to do such a thing. Wait a second, why are we hearing “Gilneas” at the same time we are shown a graphic of Horde tasks in Warfront: Stromgarde? Gilneas 2.0 was never mentioned in any of the three panels. Wasn’t Gilneas uninhabitable after the Apothecary Society plagued it? Is Ruins of Lordaeron the new Gilneas 2.0? 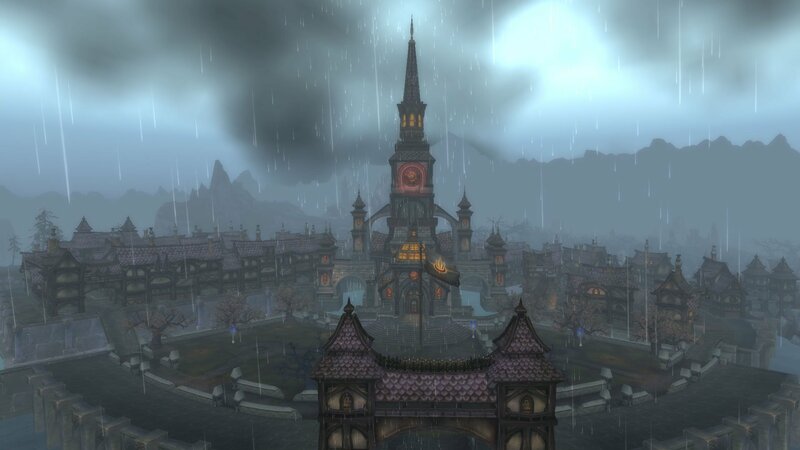 Or will Greymane rebuild Gilneas near its original city? 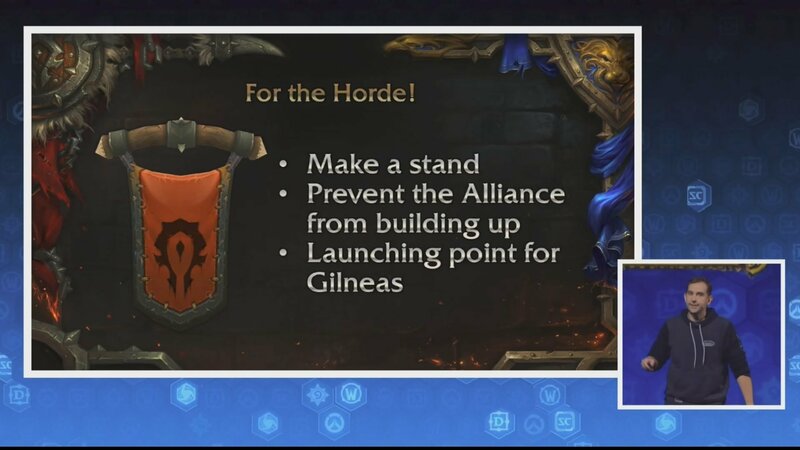 Regardless of which of both versions “might” be true, the graphic above does say we need to secure Warfront: Stromgarde to be our launching point against Gilneas. That’s right there in neon lights. This part of the panel teased us with an innuendo, and didn’t flesh out or explain what it meant. Another mystery to ponder. That also adds another layer of mystery… during an interview, the developer basically said that Warfronts is not something you queue into, but something you join when it is ready. I don’t know about you, but that sounds a whole bunch to me like Wintergrasp. If the point of attacking Stromgarde is to build a Launching point against Gilneas, that implies that if the Horde wins the Warfront: Stromgarde, the Horde controls it for X amount of hours. After Warfront: Stromgarde becomes available again, if the Alliance wins … then the Alliance takes control. This is exactly the premise of Wintergrasp where either of both factions could control it for several hours until it became active for PvP again. What kind of content is inherently to be expected in Gilneas 2.0? Will it be a daily quest hub in the open world? Will it be a Warfront: Gilneas at some point during the expansion? Will it be a proper Battleground?